1. the breaking of a part, especially a bone. 2. a break in continuity of bone; it may be caused by trauma, twisting due to muscle spasm or indirect loss of leverage, or by disease that results in osteopenia. See illustration. Treatment. Immediate first aid consists of splinting the bone with no attempt to reduce the fracture; it should be splinted “as it lies,” which means supporting it in such a way that the injured part will remain steady and will resist jarring if the victim is moved. Later it will be treated by reduction, which means that the broken ends are pulled into alignment and the continuity of the bone is established so that healing can take place. Fracture healing is truly a process of regeneration. Fractures heal with normal bone, not with scar tissue. Closed reduction is performed by manual manipulation of the fractured bone so that the fragments are brought into proper alignment; no surgical incision is made. Open fractures are highly contaminated and must be débrided and copiously irrigated in the operating room. A fracture may also require internal fixation with pins, nails, metal plates, or screws to stabilize the alignment. Once closed reduction is accomplished, the bone is immobilized by application of a cast or by an apparatus exerting traction on the distal end of the bone. avulsion fracture separation of a small fragment of bone cortex at the site of attachment of a ligament or tendon. Barton's fracture fracture of the distal end of the radius into the wrist joint. Bennett's fracture fracture of the base of the first metacarpal bone, running into the carpometacarpal joint, complicated by subluxation. blow-out fracture fracture of the orbital floor caused by a sudden increase of intraorbital pressure due to traumatic force; the orbital contents herniate into the maxillary sinus so that the inferior rectus or inferior oblique muscle may become incarcerated in the fracture site, producing diplopia on looking up. closed fracture one that does not produce an open wound, as opposed to an open fracture. See illustration. Called also simple fracture. Colles' fracture fracture of the lower end of the radius, the distal fragment being displaced backward. comminuted fracture one in which the bone is splintered or crushed, with three or more fragments. See illustration. complete fracture one involving the entire cross section of the bone. compression fracture one produced by compression. depressed fracture (depressed skull fracture) fracture of the skull in which a fragment is depressed. direct fracture one at the site of injury. dislocation fracture fracture of a bone near an articulation with concomitant dislocation of that joint. double fracture fracture of a bone in two places. Duverney's fracture fracture of the ilium just below the anterior inferior spine. fissure fracture a crack extending from a surface into, but not through, a long bone. 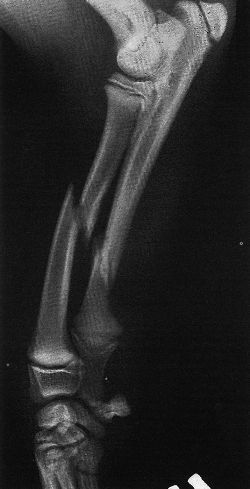 greenstick fracture one in which one side of a bone is broken and the other is bent, most commonly seen in children. See illustration. impacted fracture fracture in which one fragment is firmly driven into the other. incomplete fracture one that does not involve the complete cross section of the bone. indirect fracture one distant from the site of injury. intrauterine fracture fracture of a fetal bone incurred in utero. Jefferson's fracture fracture of the atlas (first cervical vertebra). lead pipe fracture one in which the bone cortex is slightly compressed and bulged on one side with a slight crack on the other side of the bone. Le Fort fracture bilateral horizontal fracture of the maxilla. Le Fort fractures are classified as follows: Le Fort I fracture, a horizontal segmented fracture of the alveolar process of the maxilla, in which the teeth are usually contained in the detached portion of the bone. Le Fort II fracture, unilateral or bilateral fracture of the maxilla, in which the body of the maxilla is separated from the facial skeleton and the separated portion is pyramidal in shape; the fracture may extend through the body of the maxilla down the midline of the hard palate, through the floor of the orbit, and into the nasal cavity. Le Fort III fracture, a fracture in which the entire maxilla and one or more facial bones are completely separated from the craniofacial skeleton; such fractures are almost always accompanied by multiple fractures of the facial bones. 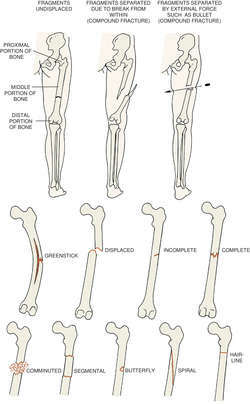 longitudinal fracture one extending along the length of the bone. See illustration. Monteggia's fracture one in the proximal half of the shaft of the ulna, with dislocation of the head of the radius. oblique fracture one in which the break extends in an oblique direction. See illustration. open fracture one in which a wound through the adjacent or overlying soft tissue communicates with the outside of the body; this must be considered a surgical emergency. The compounding may come from within (by a bone protruding through the skin) or from without (e.g., by a bullet wound communicating with the bone). See illustration. Called also compound fracture. pathologic fracture one due to weakening of the bone structure by pathologic processes such as neoplasia or osteomalacia; see illustration. Called also spontaneous fracture. pertrochanteric fracture fracture of the femur passing through the greater trochanter. ping-pong fracture an indented fracture of the skull, resembling the indentation that can be produced with the finger in a ping-pong ball; when elevated it resumes and retains its normal position. Pott's fracture fracture of lower part of the fibula with serious injury of the lower tibial articulation. Smith's fracture reversed Colles' fracture. spiral fracture one in which the bone has been twisted and the fracture line resembles a spiral. See illustration. sprain fracture the separation of a tendon from its insertion, taking with it a piece of bone. stellate fracture one with a central point of injury, from which radiate numerous fissures. Stieda's fracture a fracture of the internal condyle of the femur. transcervical fracture one through the neck of the femur. transverse fracture one at right angles to the axis of the bone. See illustration. trophic fracture one due to a nutritional (trophic) disturbance. a fracture that occurs when a joint capsule, ligament, or muscle insertion or origin is pulled from the bone as a result of a sprain, dislocation, or strong contracture of the muscle against resistance; as the soft tissue is pulled away from the bone, a fragment (or fragments) remains attached to the soft tissue of the bone. a fracture caused by the tearing away of a fragment of bone where a strong ligamentous or tendinous attachment forcibly pulls the fragment away from osseous tissue. A fracture which occurs when a fragment of bone is forced out of the surrounding bone by tightened ligaments due to a strain or intense muscle contraction against resistance. A fracture that occurs when a joint capsule, ligament, or muscle insertion of origin is pulled from the bone as a result of a sprain, dislocation, or strong contracture of the muscle against resistance; as the soft tissue is pulled away from the bone, a fragment or fragments of the bone may come away with it. The pulling away of the bony attachment site of tendons, ligament, joint capsule, or fascia. Avulsion fractures of tendons are usually caused by a forceful contraction of the muscle. Ligamentous avulsions are caused by forcing the joint beyond its normal range of motion and are often associated with sprains or dislocations. A fracture in which a strong tendon pull tears off a part of a bone at the site of the tendon attachment. Avulsion fractures of the HUMERUS are common at the upper and lower ends. A fracture caused by the tearing away of a fragment of bone where a strong ligament or tendon attachment forcibly pulls the fragment away from the bone tissue. Breakage that occurs when a joint capsule, ligament, or muscle insertion or origin is pulled from the bone as a result of a sprain, dislocation, or strong contracture of the muscle against resistance; as the soft tissue is pulled away from the bone, a fragment (or fragments) remains attached to the soft tissue of the bone. 2. a break in the continuity of bone. Fractures may be caused by trauma, by twisting due to muscle spasm, or indirect loss of leverage or by disease that results in decalcification of the bone. separation of a small fragment of bone cortex at the site of attachment of a ligament or tendon. fracture of the orbital floor caused by a sudden increase of intraorbital pressure due to traumatic force; the orbital contents herniate into the maxillary sinus so that the inferior rectus or inferior oblique muscle may become incarcerated in the fracture site, producing diplopia on looking up. one that appears on a radiograph as a fine, hairlike line, the segments of bone not being separated; sometimes seen in fractures of the skull. one that does not produce an open wound. one involving the entire cross-section of the bone. fracture of the skull in which a fragment is depressed. See also depression fracture. one at the site of injury. fracture of a bone in two places. a crack extending from a surface into, but not through, a long bone. one in which one side of a bone is broken, the other being bent. fracture in which one fragment is firmly driven into the other. one that does not involve the complete cross-section of the bone. one at a point distant from the site of injury. fracture of a fetal bone incurred in utero. one in which the bone cortex is slightly compressed and bulged on one side with a slight crack on the other side of the bone. a large space between the displaced ends of the bone has been filled by new bone. there is still a wide translucent space between the ends of the broken bone. a common type, usually seen in the shaft of a long bone, such as the femur, tibia or humerus. one in which a wound through the adjacent or overlying soft tissues communicates with the site of the break; called also compound fracture. A classification system has been used which is based on the mechanism of injury and the extent of tissue damage. In type I, a bone fragment was briefly forced through the skin leaving a communicating wound; type II fractures are caused by impact and there is damage to overlying tissues and exposure of the bone; in type III, there is extensive damage and loss of overlying tissues, including shearing and degloving wounds, with loss of vascular supply. one due to weakening of the bone structure by pathological processes, such as neoplasia, osteomalacia or osteomyelitis. fracture of the femur passing through the greater trochanter. creates a saucer-shaped fragment; caused usually by direct trauma at midshaft in a long bone. Likely to create a sequestrum. one in which a flat piece of underlying bone or tooth is separated or lost. Common in carpal bones of horses and in teeth. one in which the bone has been twisted apart. the separation of a tendon from its insertion, taking with it a piece of bone. See also avulsion fracture (above). one with a central point of injury, from which radiate numerous fissures. fracture produced by the stress created by the pull of muscles without the intervention of trauma or extreme weight-bearing. there is no discontinuity of the bone as a whole but microscopic examination shows fractured trabeculae. one at right angles to the axis of the bone. one due to a nutritional (trophic) disturbance. 3,4,7) In the event that an avulsion fracture is not radiographically visible, but is still suspected, additional imaging should be obtained. When the traction force is applied to the CCL, breakdown may occur in four different locations and forms: avulsion fracture of the CCL attachment to the clavicle, tear of the CCL itself, avulsion fracture of the CCL attachment to the coracoid process, and/or type I coracoid fracture. 5) Avulsion fractures of the anterior inferior iliac spine occur due to a straight pull of the head of the rectus femoris muscle, (3,6) and generally occur when there is hyperextension of the hip joint and the flexion of the knee, as in the action of kicking a ball. This type includes avulsion fractures of the intercondylar tibial eminence in prepubertal and pubertal children who would have suffered an anterior cruciate ligament tear if they were older. Radiographs showed a Schatzker Type II tibial plateau fracture and an ACL tibial avulsion fracture with a fragment trapped in the intercondylar notch [Figure 1]a and [Figure 1]b.
Pronation-abduction (PA) 1 Transverse fracture of the medial malleolus or rupture of the deltoid ligament 2 Rupture of the syndesmotic ligaments or avulsion fracture of their insertions 3 Short, horizontal, oblique fracture of the fibula above the level of the joint IV. X-rays may be ordered to rule out an associated avulsion fracture. Pointinger H, Munk E Poeschl GE Avulsion fracture of the anterior superior iliac spine following apophysitis. Stewart's classification differentiated between type I, extra-articular fracture between the metatarsal base and diaphysis; type II, intra-articular fracture of the metatarsal base; type III, avulsion fracture of the base; type IV, comminuted fracture with intra-articular extension; and type V, partial avulsion of the metatarsal base with or without a fracture. This avulsion fracture is stable in flexion, but highly unstable in extension (Davenport 2009). Additionally, he has been playing with an avulsion fracture in his right index finger since smashing it against an errant pass during the Lakers' victory Dec.